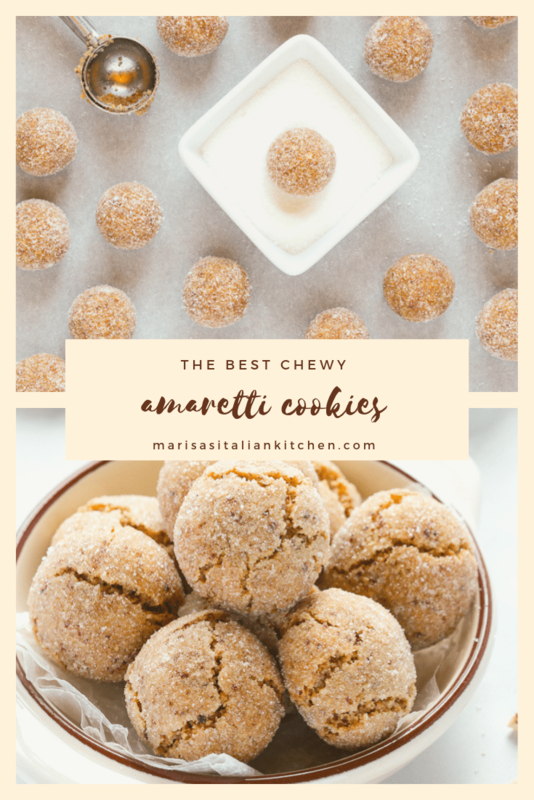 These Chewy Amaretti Cookies are another wonderful and well known treat to come out of Italy and a true Italian classic. They have a crispy outer edge and an irresistible chewy centre. You’ll be hard pressed not to devour the whole plateful in one siting. On one of my many frenzied baking moments last Christmas, I baked a batch of Ricciarelli, Italian Almond Cookies. I brought some in to work to share with my colleagues. Once in a while they’re my designated and very happy taste testers. One friend and colleague, Mary, remarked on how much they tasted like her mom’s amaretti cookies. She very graciously offered to share her mom’s recipe with me and encouraged me to change the recipe to my liking. But how does one improve on perfection? They’re absolutely amazing, which my family can happily attest! And greedily so as they were gone in mere minutes. 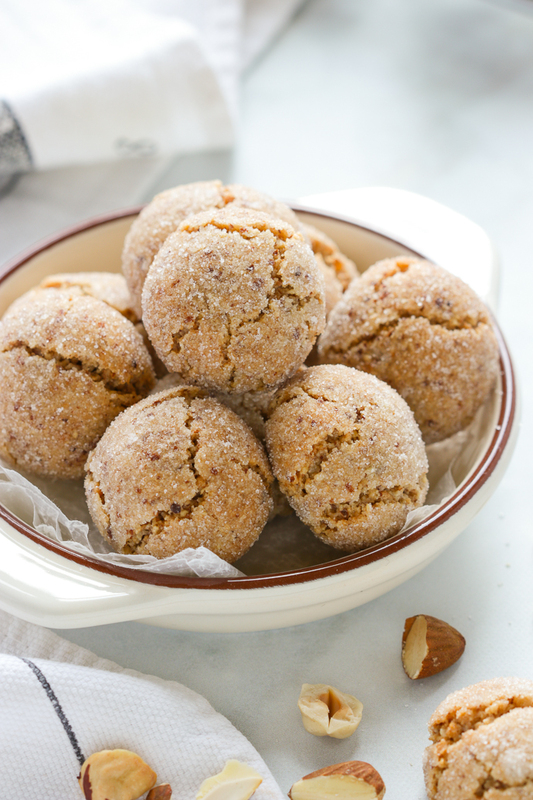 This type of amaretti is simply one of many that can be found in different Italian households. They mostly consist of one type of almond flour or almond paste with the addition of sugar, egg whites and flavourings. You can use purchased almond flour or simply grind whole roasted almonds as finely as you can using a food processor. Whether the almonds are peeled or not really doesn’t make any difference in taste. It does however change the over all colour of the cookie. Peeled almonds will yield a paler looking cookie whereas almonds with their skin intact will render a sun kissed golden brown colour. You’ll note that in this recipe, Mary’s mom uses one part hazelnuts to three part almonds. I truly love this combo and kept the recipe as is but you can use all almonds instead. Not only do these cute little morsels have a pretty golden hue, they also smell simply wonderful! And they’re gluten free! 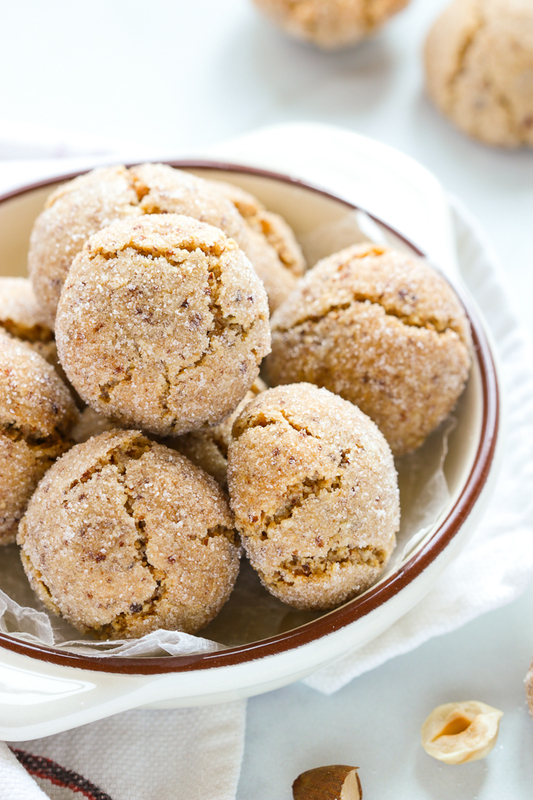 Are Amaretti Cookies Easy To Make? 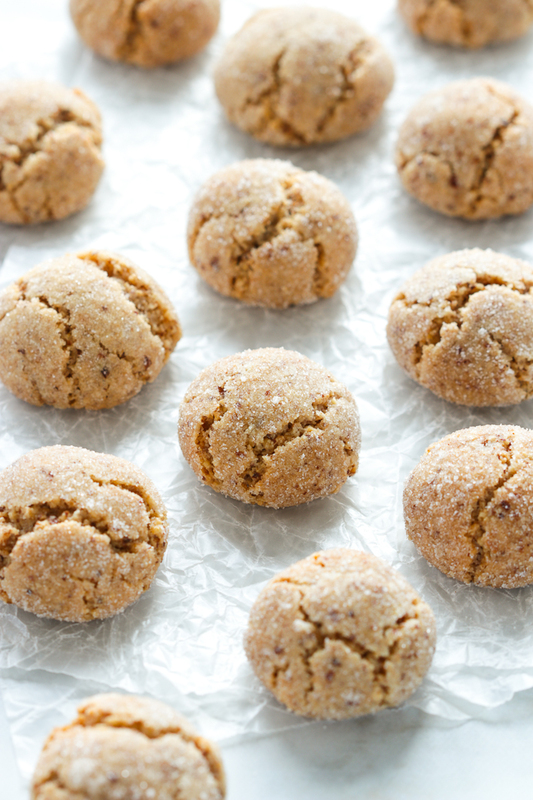 Amaretti cookies are by far one of the easiest cookies to ever make. They require just a few simple ingredients so do use the freshest almonds possible. Not those year old almonds stored why back in your pantry. Or that forgotten batch of almonds tucked in the far corner of your freezer from way back when! And seriously, you don’t even need any special equipment! Just two bowls. One for whisking the dry ingredients and one for beating your egg white in. Which you can also beat with a fork…or a whisk. Unless you choose to use your electric mixer. In which case, I’ll leave that part up to you. But just remember not to over beat the egg white. You just want soft peaks! An extremely helpful tip that Mary’s mom has is a trial bake. She bakes 3 to 4 cookies to see how they turn out. If the cookies flatten overmuch she’ll add a little more finely ground almonds to the mixture. If the dough is too stiff she’ll mix in a little more egg white. I’ve tested this recipe 3 times and each time they turned out just wonderfully. So delicious! As a personal preference, I chilled the dough for one hour before shaping and rolling the dough in the sugar. This helped achieve perfectly domed shapes. A cookie scoop also helps tremendously in making equal sized cookies. I used one of 1 1/4 inch round in size. Use the 15 minutes of baking time as a guideline. Check them after 12 minutes to make sure they are not over browning as not all ovens are created evenly. I doubled up on my baking pans because these cookies benefitted from a double insulation. They turned out with an even all round crispiness and chewy centres. Light brown in colour with crisp crackled tops…and so pretty to look at! If you prefer them even more crispier then simply leave them for another minute or two. 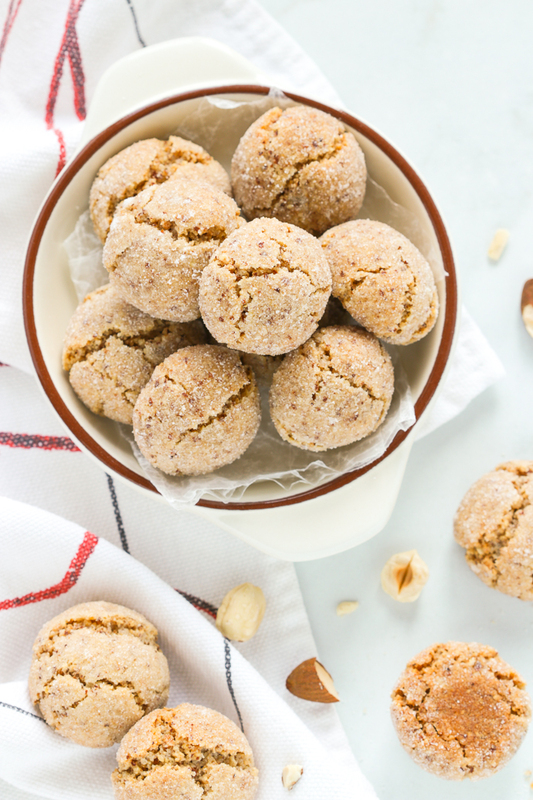 These chewy amaretti cookies are especially wonderful savoured with a sweet wine or equally enjoyable with your favourite cup of tea or coffee! A classic Italian Cookie. 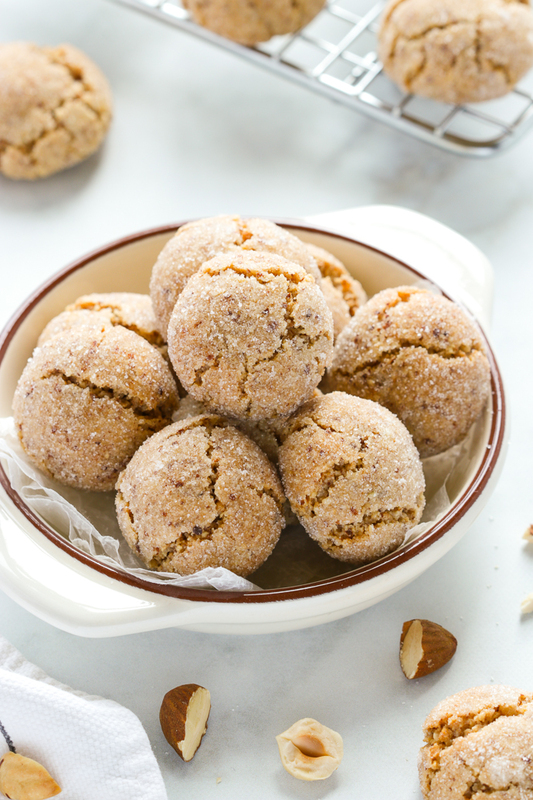 These Amaretti cookies have crispy outer edges, soft chewy centres and are gluten free. Place both nuts in a food processor and grind to a very fine sandy consistency. Take care not to turn it into a nut butter. In a medium sized bowl whisk together the ground nuts, granulated sugar and a pinch of baking powder. Set aside. In a separate small bowl beat the egg white to a soft peak. Stir the almond extract into the egg white mixture. With a fork, stir the egg white mixture with the nut mixture until well combined. Cover with cling wrap and chill in the fridge for 1 hour. Use a cookie scoop of about 1 1/4 inch round to scoop up pieces of dough and shape them in a circle using your hands. If you don't have a cookie scoop, a well rounded teaspoon will do. 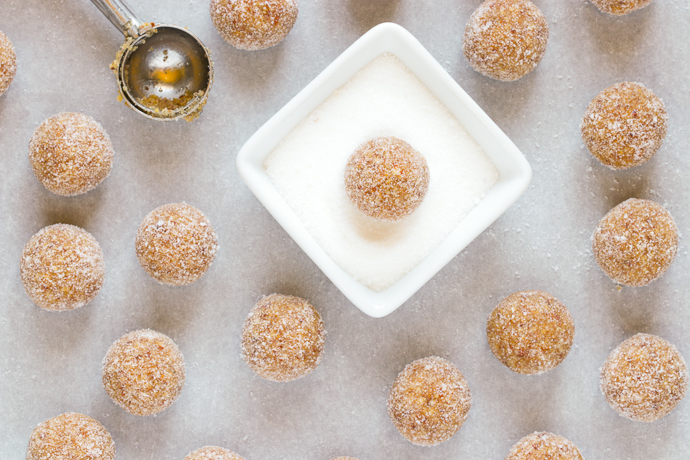 Roll the cookie ball in granulated sugar and place onto the prepared cookie sheet. Repeat with the remaining cookie dough, spacing the cookies about 2 inches apart. Bake in the preheated oven for about 12 to 15 minutes. When ready the cookies will look light brown in colour with crisp crackled tops. Allow the cookies to cool on the pans placed over a cooling rack. The cookie dough shouldn't be too sticky to roll with your hands but if you do encounter some stickiness simply dab your hands with a teeny bit of water and continue rolling and shaping the cookie dough. 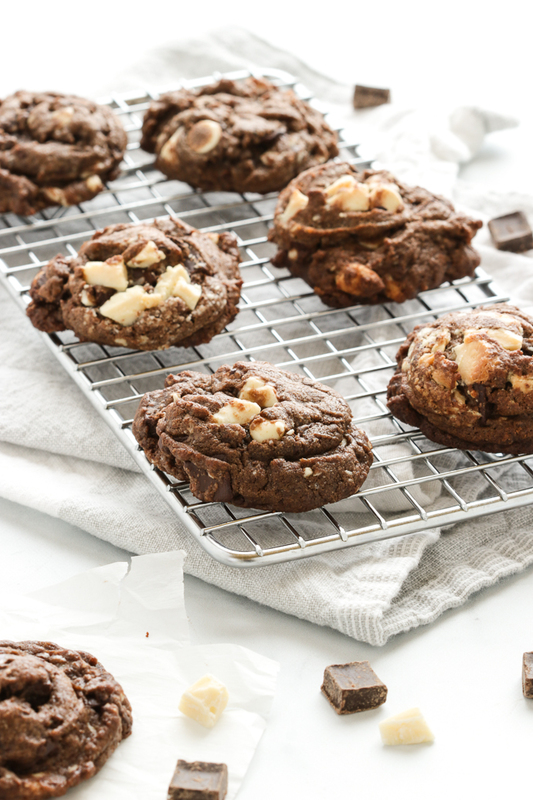 When it comes to decadent cookies these Triple Chocolate Cookies certainly fit the bill. This post was originally published on February 4, 2015 and republished Jan 31, 2019 with updated photos and content. 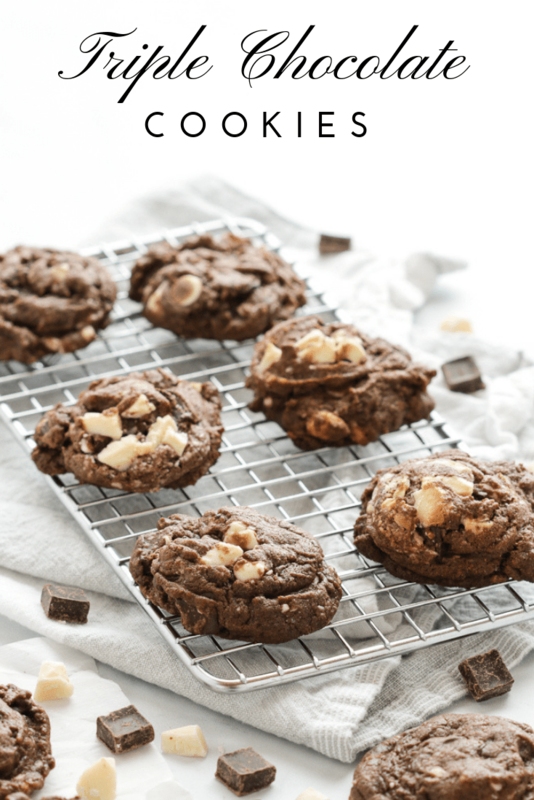 They’re a trifecta of pure cocoa and chock full of both semisweet and white chocolate chunks as well as white chocolate chips. The addition of instant coffee granules elevates these heavenly cookies with amazing mocha flavour! 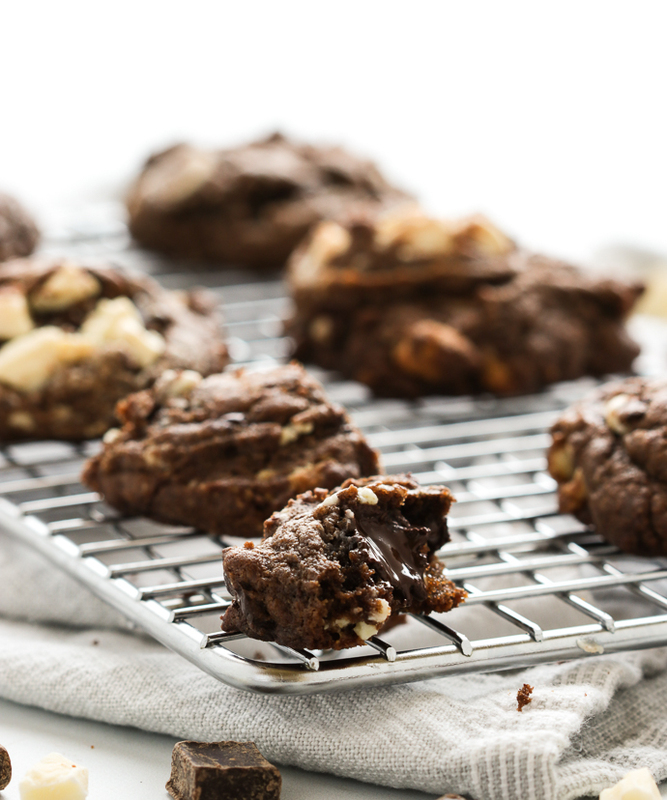 You’ll find them soft and chewy with loads of gooey melted chocolate when bitten into…just the way I like my cookies. These triple chocolate cookies are just about ready to hit the oven right after mixing the dough together. However, if you love and want more of that concentrated chocolate flavour, then do chill the dough overnight. This cookie dough is a rather stiff dough to start off with. So, if you do chill the dough overnight then simply remember to allow the dough to sit at room temperature for about an hour or two. This will make it easier to scoop out and bake. A good old tablespoon is enough to scoop up chunks of cookie dough for baking. However, if you have a small ice-cream scoop of about 1 and a half inch to 2 inches, this would work even better. It allows you to swoop in and scoop and releases the cookie dough without much effort. 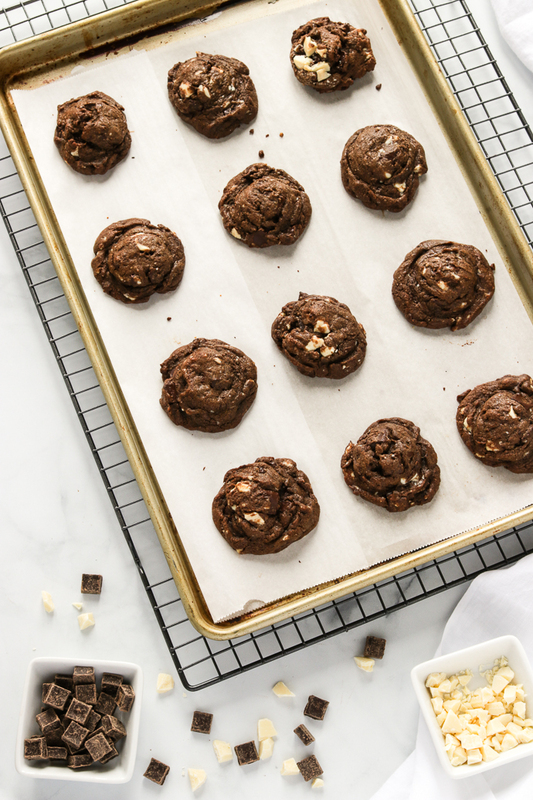 You’ll probably get a good 3 dozen medium size cookies…give or take a few! However you can make them larger if you wish. Simply remember to adjust the baking time accordingly for bigger cookies. A useful tip to chewy gooey cookies, is not to over bake them. For cookies with soft and chewy centres, bake them for about 8 minutes. They’ll be very fragile when removed from the oven so allow them to cool in the baking pan placed over a cooling rack. If you like them crispier around the edges then simply bake them for 10 to 12 minutes. 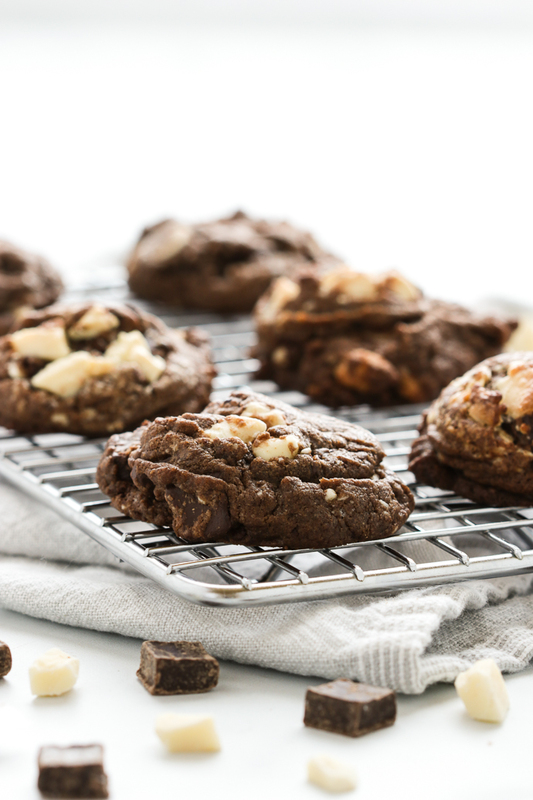 Triple chocolate cookies, chock full of both semi-sweet and white chocolate chunks and semi-sweet chocolate chips. A heavenly decadent cookie. In a medium size bowl combine the flour, unsweetened cocoa powder, baking soda, coffee, salt and set aside. In a large bowl using an electric mixer, cream the butter and both the sugars together. Add the eggs and vanilla and mix till blended. Mix in the flour mixture. Stir in the chocolate chips, chopped semi-sweet chocolate and chopped white chocolate. Using a cookie scoop or spoon, form balls into large walnut size chunks of dough. Bake 10 to 12 minutes, they should look just barely set with a shiny sheen. Remove from oven and let cool 15 mins. This recipe was adapted from The Best of Better Baking by Marcy Goldman. One of my favourite cookbooks, with lots of insightful information to turn anyone into a better baker. A wonderfully soft and pillowy, Chickpea and Red Onion Focaccia topped with sweet golden raisins. This focaccia makes a delicious anytime snack or a complimentary side dish to a steaming bowl of soup. Straight out of the oven comfort foods such focaccia are always met with much anticipation at my house. The allure of freshly made bread or rather focaccia, which is essentially a flatbread has a broad appeal to both adults and young ones. I especially love how and with very few ingredients you truly get so much. All it takes is some flour, yeast and water. A few add ins for flavour such as salt, sugar and olive oil and you have something so easily achieved in your own kitchen. One other addition that bears mentioning here is mashed potatoes! I can’t stress enough how the humble potato takes bread dough to a whole other level! Surprisingly, it renders the dough so light, airy and fluffy. You immediately feel this as your kneading the dough. It’s like holding a pillowy soft cloud in your hands! Well almost! And not that I know what a cloud feels like…but you get where I’m going with this! You can top focaccia with just about anything! A favourite sweet version of mine is Schiacciata Con L’uva, a sweet tuscan flatbread with grapes. Its a lip smacking delicacy that I simply never get enough of when the best coronation grapes are in season! However, this time of the year is a perfect time to make do with a few good old pantry ingredients. Adding raisins to savoury dishes was very common while growing up. Sweet plump raisins always made an appearance in calzone with greens such as my Swiss Chard Mozzarella Calzone. To use raisins in this focaccia recipe, you’ll first want to plump them up by soaking them in hot water for about ten minutes. Then make sure to drain them, pat them dry and scatter over the focaccia before adding other toppings. This will ensure they don’t burn while nestled beneath the other toppings. I adore caramelized onions and have often used them as a pizza topping. Take care to not cook them overmuch. You simply want them softened and translucent as they will continue to caramelize in the oven. I thought it would be a neat way to try focaccia in my cast iron pans. I used 3, 8 inch round pans for this recipe but really any size pan will do. If all you have are rectangular rimmed baking sheets, those will work as well. You can use one as large as 15 x 10, in which case it will yield one rectangular focaccia. Which ever size you use, do grease your pans with oil and then sprinkle them with coarse cornmeal. This will ensure crispy bottoms and edges and facilitates easy removal! Enjoy as an appetizer or serve alongside your favourite salad or hot bowl of soup! A wonderfully soft and pillowy, chickpea and red onion focaccia topped with sweet golden raisins. This focaccia makes a delicious anytime snack. Place the sugar and warm water together in a large bowl and stir to dissolve. Sprinkle in the yeast and let this stand until frothy, for about 10 minutes. Once it's frothy, stir in the 2 tablespoons of extra-virgin olive oil. In a small bowl, mix the mashed potatoes with the salt. Gradually stir in the flour, approximately 2 1/2 to 3 cups until the dough pulls away from the sides of the bowl. Transfer the dough to a well floured work surface. With floured hands knead in as much of the remaining flour as needed, until the dough is smooth and has a slightly sticky feel. About 8 minutes. Place the dough in a large greased bowl, turning to grease all over. Cover your dough with cling wrap and let it rise in a draft free space until it has doubled in size, for about 1 hour. Grease 3, 8 inch cast iron skillets with oil and sprinkle with the coarse cornmeal. Divide the focaccia dough into 3 equal portions and place into the prepared cast iron skillets. Cover the pans with greased cling wrap and and set aside to allow the dough to puff up to the rim of the pans for about 45 minutes to 60 minutes. Meanwhile heat a tablespoon of olive oil in a medium sized frying pan. Add the sliced red onions to the frying pan with a sprinkle of salt and pepper. Cook over low heat while stirring occasionally, until the onions are soft and translucent, for about 5 minutes. Meanwhile, place the raisins in a small bowl and cover with a little bit of hot water. Allow to soak for about 10 minutes until the raisins plum up. Drain the raisins and pat dry. Set aside. Remove the cling wrap from the risen dough. Scatter first the raisins over the dough then top with the chickpeas, the sautéed onions and using your fingers gently press down into the dough while making indentations. Bake in the preheated oven for about 25 to 30 minutes, until the edges are crusty and the focaccia is golden brown. Sprinkle a pinch or 2 of coarse sea salt over each focaccia while still warm. Allow to cool a little before slicing and serving. 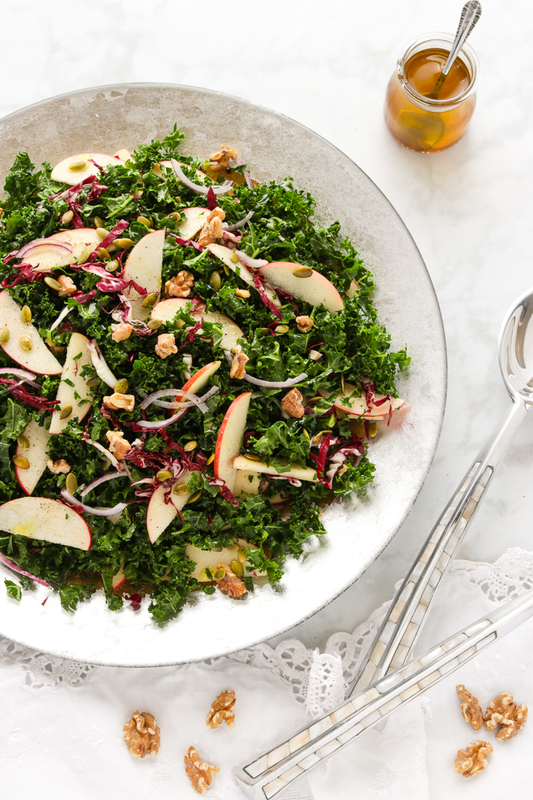 A wonderful and colourful Apple Walnut Kale Salad that is packed with nutrients and makes a striking side dish to fish, poultry or any other meat dish. Have you made any New Year’s resolutions yet? I haven’t! Mostly because…well…they simply never seem to stick! My resolutions had always revolved around food. Eating healthier, exercising more or at the very least trying to be more active. And I know I’m not alone here especially if your own resolutions revolve around healthier eating habits as well. 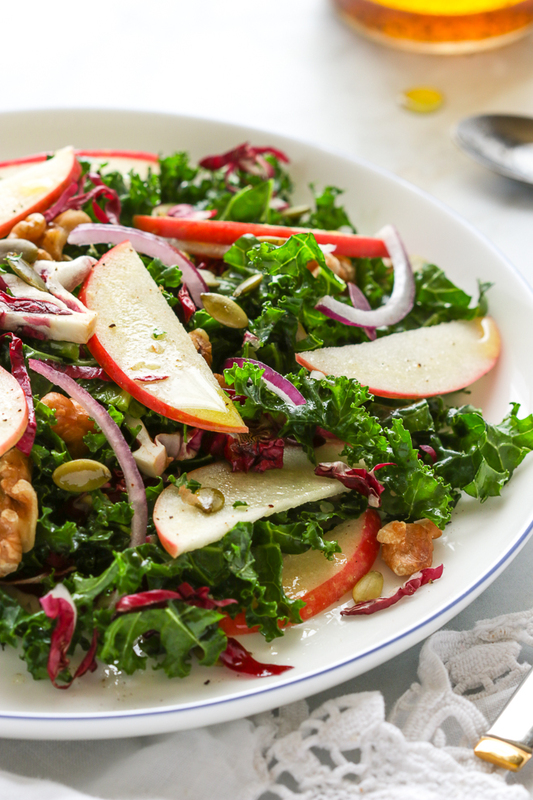 If so then you’ll appreciate this easy to make Apple Walnut Kale Salad! It’s utterly delicious and a welcome reprieve from all the holiday baking! 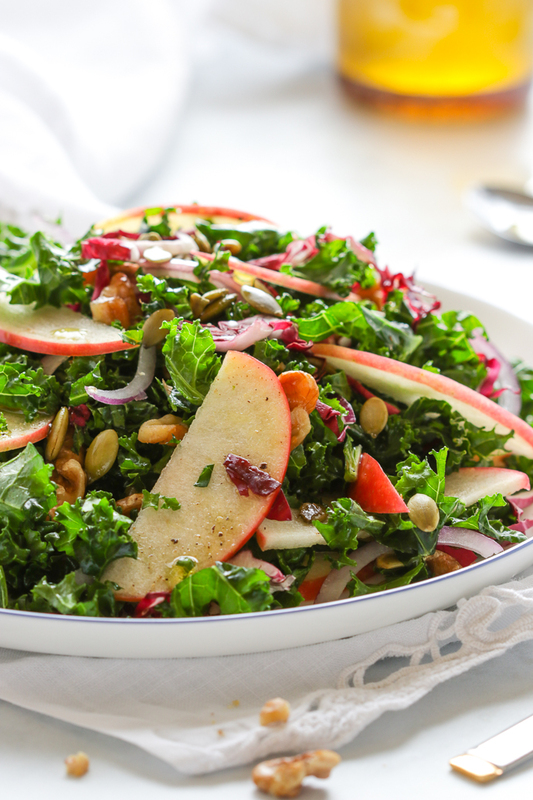 The main ingredient in this nutrient packed salad is kale, the king of all greens. I’ve combined thinly sliced crispy red apples for a little sweetness and some toasted walnuts and pumpkin seeds for a delightful crunch. For a slight contrast in colour, I’ve added slivers of radicchio and red onion slices. Tossed with a simple vinaigrette of extra virgin olive oil, apple cider vinegar, a little salt and pepper for one glorious delicious salad. I can’t sing the praises high enough for toasted walnuts or any other nut for that matter! That wonderful aroma from freshly toasted walnuts to their crunchy nutty bite gets me every single time! Often enough I find myself secretly hiding stashes of roasted nuts simply so they’re on hand when needed in a recipe. There’s really no recipe required here. You can toast them in the oven for about 10 minutes at 350 degrees F., until fragrant and they take on the appearance of a slightly darker shade. Or, you can pan toast them on the stove top which is a little quicker but requires more attention. No distractions allowed here! Trimming kale is really quite simple. You’ll need a cutting board a pairing knife and a flat surface to work on of course. Simply lay the leaf flat on the cutting board and with the pairing knife carve away the rib with the hard fibrous stem and discard. Chop the kale leaves and rinse in a colander under cool running water. Spin the leaves dry in a salad spinner and use in your favourite salad, soup or any other yummy dishes. So simple, right? Cheers to a wonderful, blessed year to all dear readers! 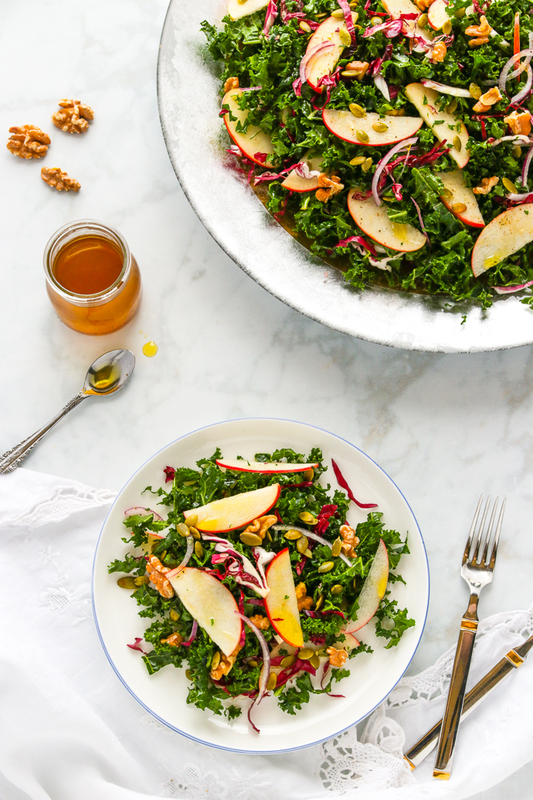 A wonderful and colourful Apple Walnut Kale Salad that is packed with nutrients and makes a striking side dish to fish, poultry or any meat dish. Remove the rib with the hard fibrous stem from the kale leaves and discard both the stem and rib. Chop the kale leaves into small pieces. Rinse the kale leaves, spin them dry in a salad spinner and transfer the kale to a large salad bowl. Drizzle just a little bit of extra virgin olive oil over the chopped kale and massage in with clean hands. Rinse the radicchio leaves, pat dry and slice into thin strips then set aside with the kale. Wash the apples under cold water then dry and cut into thin slices. Transfer to the salad bowl. Add the sliced red onions, both the toasted walnuts and pumpkin seeds to the salad bowl. In a small bowl whisk together the oil, vinegar with salt and pepper to your taste. Toss with the kale mixture, plate, serve and enjoy to your hearts content! Ricciarelli, Italian Almond Cookies are typical Christmas cookies from Siena, Italy. They’re exquisite little morsels and a joy to make! As I reflect each year on which cookies to add to my Christmas cookie platter, a balance of different textures and flavours is what I look for. Some have to include a type of nut while some are without. I would need at least one colourful treat to brighten up the mound of cookies piled up high on my holiday platter. Such as these Italian Rainbow Cookies. And then we mustn’t forget family members with dietary restrictions such as those who are gluten intolerant! They too need a perfectly satisfying sweet nibble! This is where these Ricciarelli make an appearance! What I love about these cookies is that you really don’t need any serious baking skills. It’s simply a few very good quality ingredients consisting mostly of finely ground almonds and some powdered sugar. They’re almond and lemon scented and also wonderfully perfumed with the seeds of a vanilla bean. A touch of beaten egg whites binds the ingredients together to bring you a deliciously soft and chewy cookie with its distinctive crackled appearance. You can make this cookie in different stages if you wish. Day 1…you can blanch your own almonds if your so inclined. This is a process I really enjoy doing and extremely easy to do. You can check out my notes below. Day 2…you can prepare the cookie dough and refrigerate over night. Day 3…slice, shape and bake! Its pretty simple right? Told you so! Aside from being a Sienese Christmas treat, these cookies are customarily shaped into an oval or diamond form. Some would say that the oval shape was meant to represent the eyes of the Madonna by Renaissance painters. However, according to one legend it is said that a noble knight, Ricciardetto Della Gherardesca introduced the diamond shaped form of this cookie. Its oval shape with the pointed tips greatly reminded him of the Sultan’s slippers from his crusades of the far East. Hence the name Ricciarelli! Whatever shape or form you decide on, I’m sure you’ll agree these cookies reign supreme in elegance and simplicity. Serve alongside your favourite sweet wine or Vin Santo and enjoy them in the company of your wonderful family members or friends! Ricciareli, Italian Almond Cookies are deliciously soft and chewy cookies with a distinctive crackled surface. A typical Sienese Christmas cookie. In a food processor, pulse together the blanched almonds with 3/4 cups of the powdered sugar until fine in texture. Add in the remaining sugar, lemon zest, almond extract, the vanilla bean seeds and pulse together until very fine. Set aside. In a small bowl, beat the egg whites with a fork just until foamy. Add the beaten egg whites to the almond mixture, 1 teaspoon at a time while stirring just until you've achieved a stiff dough. Dust your hands and a flat work surface with a little powdered sugar and roll out the cookie dough into a log about one inch and a half in diameter. Wrap with cling wrap and refrigerate for 8 hours or overnight. Slice the cookie dough into 24 equal portions and roll each into a ball. One at a time, slightly flatten each ball between the palms of your hands while forming into an oval shape. Place the shaped cookies onto the prepared baking sheets while spacing them 2 inches apart. Dust generously with powdered sugar. Bake one sheet at a time in the preheated oven for about 12 to 15 minutes or until the sides are pale golden in colour. Take care not to over bake them. They should look dry and not overly dark. Allow to cool completely before removing from the baking sheet as these cookies are very soft and fragile when removed from the oven. Enjoy with your favourite sweet wine or Vin Santo. They keep well for up to a week at room temperature sealed in an air tight container. Place the almonds in a pot of boiling water and allow to simmer for about 60 to 70 seconds. The almonds will start to rise and bob on the surface. The skin will have a shriveled up appearance. Drain the almonds and run under cold water then pat dry with a clean dish towel. One at a time, gently press on the almond between your thumb and index finger to release the nut from its skin. Allow the blanched almonds to dry at room temperature, on a clean dish towel, before proceeding with the recipe. This can also be done overnight. If your pressed for time you can dry the almonds in a low heated oven for 5 minutes or so.